You probably already know that an unhealthy digestive tract can inhibit weight loss efforts. Constipation and sluggish bowels can work against you and so can an unhealthy gut. From the moment we are born we get exposed to bacteria. This is actually a good thing because we need to have what is considered “good” bacteria for many things including digestive health. Among these are – probiotics. Over the past 100 years the world we live in has been chemically altered in many ways. Initially these changes were seen as helpful. And they are. We consume chemicals daily – like the chlorine in our drinking water. This is necessary so our water will be safe to drink. The downside is the chlorine also kills the GOOD bacterias too that we need to healthily digest our food. Unhealthy digestion can be a cause of unexplained weight gain too. Could this be the connection between you and your weight gain? 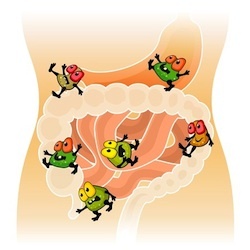 The human gut requires several types of healthy bacteria for optimum function. Probiotics are used to help with food digestion. They help to maintain a healthy immune system and intestinal bacteria. They also help to improve the absorption of calcium and the processing of vitamins B. Some foods naturally have probiotics in them and some have them infused with probiotics. For example yogurt is a fermented food that contains natural quantities of probiotics. Unfortunately if you are buying it off the grocery store shelf it probably isn’t as good a source of probiotics as it could be. Again what is in place to protect us from harmful bacterias – like the heat pasteurization of dairy products – also kills the good stuff. Meaning, off-the-shelf yogurts probably won’t meet the needs of an unbalanced gut. Worse yet – frozen yogurts are mostly void of probiotics. With an abundance of commercially manufactured probiotics to choose from, what should a person look for? As with most things cheap usually isn’t best. That is because a high-quality product should have more than one “effective” bacteria. The instructions of how many and when to take need to be specific too. Other things to be conscious of is to ensure it is the type that will survive in the intestine and make sure it is fresh by the noting expiry date. According to some research an active lactobacillus acidophilus is the best type. When discovering available types of probiotics this should be listed in the ingredients. Another form of health promoting bacteria is called prebiotics and offers a compliment to probiotics. An example of natures nurture is the RAW honey produced naturally by bees. The “job” of the prebiotic is to promote health for the probiotics. It helps to make sure the probiotics grow and stay lively in the digestive tract. Fermented vegetables are full of beneficial bacteria. More-so than any probiotic supplement. You can buy them or make them yourself.